SurveyMonkey CX is an NPS (Net Promoter Score) solution that enables businesses to collect, understand, and act on their customer feedback and get actionable insights. Users can trigger personalized surveys through multiple channels, identify improvement areas using advanced analytics, and close the loop with customers by triggering follow-up actions. SurveyMonkey CX helps captivate customers throughout the entire user journey. Organizations are able to monitor and optimize customer satisfaction at all relevant interaction points such as purchasing, onboarding, or post service requests to increase retention. All CX surveys are designed to be quick, clean, and branded for the business, and come with easy editing functionality for changing colors, upload logos, customizing the language, and editing questions, all within an easy-to-use interface. 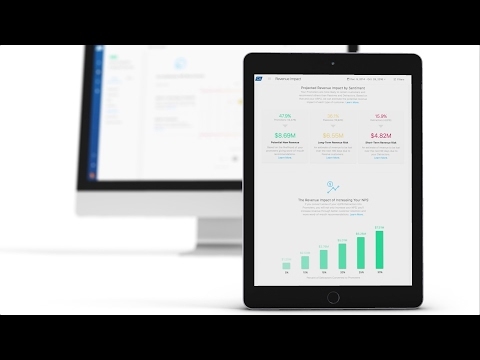 Users can upload customer lists and NPS data captured with SurveyMonkey and TechValidate, as well as trigger NPS surveys from Salesforce. Users can also embed CX surveys in marketing campaigns, share survey links, or trigger surveys using SurveyMonkey’s API. With SurveyMonkey CX, businesses can analyze customer satisfaction with real-time NPS trends and an intuitive dashboard to instantly drill down to spot problem areas. Powerful filtering tools enable users to filter, segment, or cross-tab NPS by date, answer, country, or any other attribute, while sophisticated algorithms auto-categorize any open-ended responses. Geographic NPS maps provide a global view of customer satisfaction, and users can benchmark their NPS using the world's largest NPS benchmark dataset. Additional features include survey scheduling, reminders, data export, and automatic sync with Salesforce. My overall experience with Survey Monkey CX has been great from the start. They provide exceptional customer service and their staff are always keen to listen to any suggestions we have of additions to the software that could help us.The customer support you receive with Survey Monkey is excellent. They are always on hand via phone or email to help with any questions or queries you may have. The software itself is easy to use whilst being able to provide great insights into how our own customers rate all areas of our service, which in turn helps us to improve our own service as a business. The new reporting feature also saves us time when we have to create our own CX feature reports by providing us with an NPS score breakdown and also showing us our NPS trends. The customer support you receive with Survey Monkey is excellent. They are always on hand via phone or email to help with any questions or queries you may have. The software itself is easy to use whilst being able to provide great insights into how our own customers rate all areas of our service, which in turn helps us to improve our own service as a business. The new reporting feature also saves us time when we have to create our own CX feature reports by providing us with an NPS score breakdown and also showing us our NPS trends. It would be beneficial to have an export or download feature on individual responses as we do a lot of work through the month based on specific replies and this can make the process quite manual for us. Survey Monkey CX - Pure Awesomeness!!! Survey Monkey CX has added invaluable insight to our business. We have introduced NPS monitoring by using targeted surveys which allows our client to provide valuable and immediate feedback about our services. This has been invaluable in revealing what we didn't know allowing us to take appropriate action to improve our services and internal procedures and processes. I like the overall simplicity of the UX which makes it really easy to follow and use. It's not easy to keep things simple but still deliver a professional product that is both easy to use and full of features. I like the overall simplicity of the UX which makes it really easy to follow and use. It's not easy to keep things simple but still deliver a professional product that is both easy to use and full of features. There is a bit of effort required to maintain the contacts and keep this up to date. Would be good if this can be automated. The BEST CX Software available! One of the biggest issues at my previous job was not having the resources to be able to get information from and about our customers/clients, SurveyMonkey CX solved this issue for me, I love being able to prepare a survey asking exactly what questions I need to be answered. Plus at the end of each survey, you are given the option to sign up for regular surveys and you are rewarded by gift card or you can choose to have your earnings donated to a charity.SurveyMonkey CX is one of the best software I have used in a while, it is so simple to use, but what I really like about this software is how easy it makes to get customer feedback, comments, ideas, etc. SurveyMonkey CX is one of the best software I have used in a while, it is so simple to use, but what I really like about this software is how easy it makes to get customer feedback, comments, ideas, etc. There is not anything really that I disliked about the SurveyMonkey CX software. NPS is used mainly to give our customers a voice to drive business improvement. We have used the data for some larger projects and to quantify the need for cultural changes with our staff.I have been using the software since early days and have watched the functionality develop over time. My relationship with the sales and support team has allowed me to provide direct feedback that has led to functional enhancements that suit my needs. I have been using the software since early days and have watched the functionality develop over time. My relationship with the sales and support team has allowed me to provide direct feedback that has led to functional enhancements that suit my needs. To date you cannot change the granularity of the 'frequency touch rule', meaning you can ensure customers are only sent surveys 1, 2... 12 monthly, but cannot set it to days or weeks. Lack of customization for specific needs, this software is definitely built for a "specific" client. My needs are different and I have had to accept that some of my desires for the software will not happen. The actual sending interface of the survey is TERRIBLE, it is incredibly confusing if a survey sent, which ones sent and when. I wish it interfaced more with others systems instead of being self contained. For example, if there is a bad response, I want to be able to export that survey and email it to someone, looping them into the chain. Instead it has to ALL be in survey monkey. In my world, the person that sends the survey is not the person that should be doing the followup. SurveyMonkey CX offers plans that fit your business needs. Whether you’re just getting started with a holistic NPS program or have sophisticated needs, SurveyMonkey CX scales with you. • SurveyMonkey CX supports responsive emails and surveys that look great on every device including iOS, Android, and all modern desktop browsers and email clients. • Get a global view of your customer satisfaction with automatic response geotagging and interactive NPS maps. • Powerful filtering tools enable users to instantly filter, segment, or cross-tab NPS by date, answer, country, or any other attribute. • Identify improvement areas using advanced analytics and easily share insights with your team. • Create custom follow-up questions to gain deeper insight into your NPS data. Below are some frequently asked questions for SurveyMonkey CX. Q. What type of pricing plans does SurveyMonkey CX offer? Q. Who are the typical users of SurveyMonkey CX? Q. What languages does SurveyMonkey CX support? Q. Does SurveyMonkey CX support mobile devices? Q. Does SurveyMonkey CX offer an API? No, SurveyMonkey CX does not have an API available. Q. What other apps does SurveyMonkey CX integrate with? Q. What level of support does SurveyMonkey CX offer?